Our last night in the Big Easy came around far too quickly! To say an appropriate ‘goodbye’ to one of my favourite cities, we decided to pay a visit to a quirky part of town frequented by NOLA residents and affectionately referred to as the ‘local’s Bourbon’, Frenchmen Street, which is situated near the French Market, just North of the Quarter itself. Frenchmen Street is rumoured to contain the highest concentration of live music in all of New Orleans; on the night we visited this was particularly apparent as each bar and club was extremely lively early on in the evening, packed with visitors bound for the famous jazz festival the very next day. Frenchmen Street features numerous lively and characterful bars and restaurants but be warned, even on an ordinary night it does get very busy and you may have to queue to even get in, let alone for a seat! 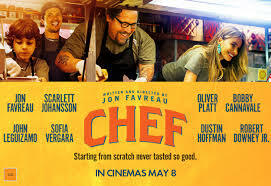 Late night food trucks once graced this part of town; this tradition was even captured on the silver screen in the recently released ‘Chef’ starving Jon Favreau when ‘El Jefe’ was parked on Frenchmen whilst Carl and his son ventured to nearby Café du Monde for beignets. However, on our visit there were none to be seen! Rumour has it this is due to an on going argument with city…..lets hope this isn’t the case forever!! Although there are no food trucks to chose from, there are a number of great places to eat offering a whole host of different cuisines down Frenchmen. We were lucky enough to grab a table right in front of the stage in the tiny but atmospheric ‘Three Muses’. The bar has an extensive cocktail menu and a lively atmosphere, with vibrant art work on the walls, a bubbly crowd of locals and tourists alike and live music most nights; it is the perfect place to people watch or catch up with friends but be warned, they do not take reservations! Onto the food……wow!! The food here is amazing, a real fusion of creole cuisine and street food. Portions are small, which was perfect for us due to too much over-indulgence, but it is advisable to order a several dishes and share with your fellow diners, like tapas! 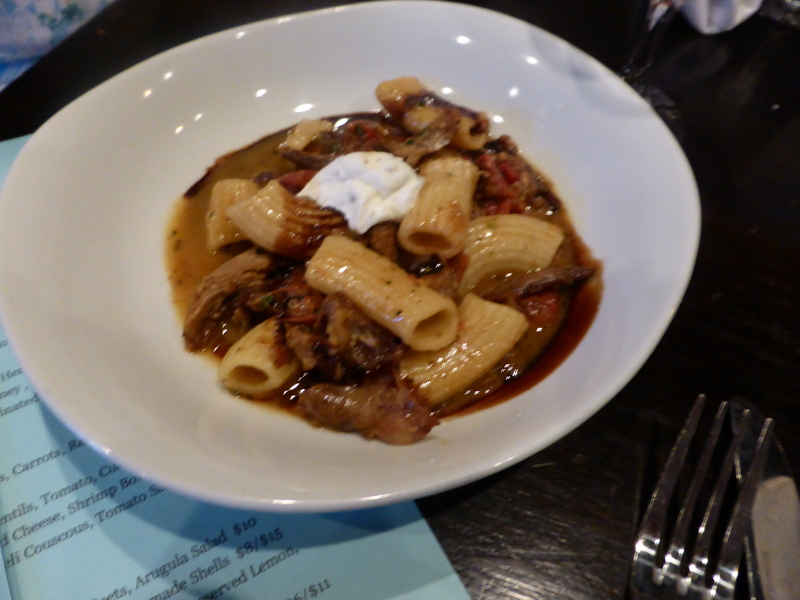 My Mom opted for the ‘Herbs de Provence Roast Duck – Housemade rigatoni, eggplant, tomatoes and goat’s cheese’. She thoroughly enjoyed the dish and said it was full of flavour and nicely cooked. 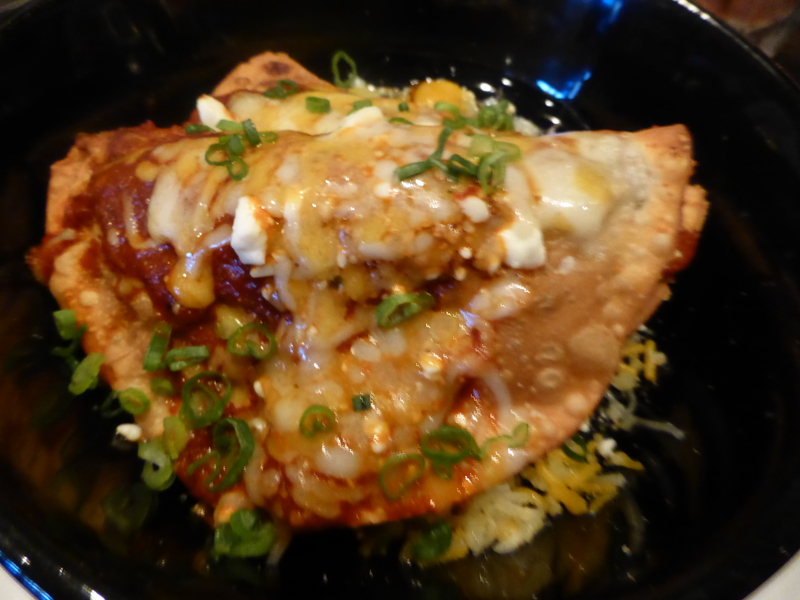 I opted for the ‘Crawfish Enchilada – Louisiana crawfish, melted cheese, shrimp boil chilli sauce’. Even though it has been several months since I ate this, I can still practically taste it, it was delicious! The enchilada was perfectly crisps which provided a nice contrast to the gooey melted cheese; the sauce was not overpowering and complimented the delicate seafood flavour well. 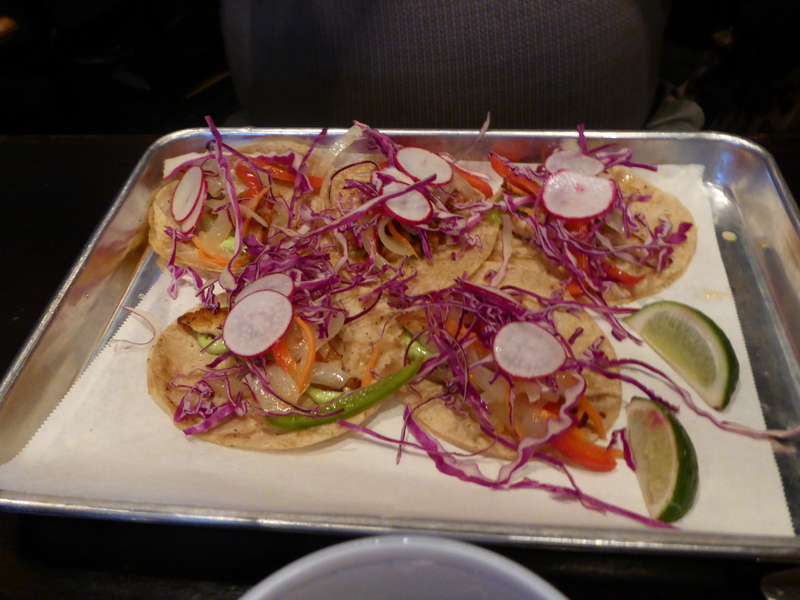 Dad also opted for a seafood dish in the form of ‘Gulf Fish Tacos – Cumin marinated peppers, onions, carrots, red cabbage, chimichurri aioli, corn tortillas’. I loved the presentation of this dish, although simple, I thought it was very effective. My Dad was a bit confused when he saw that his main was served in a roasting tray though! The tacos, like most places in America, were served soft, something which I really do prefer as I find hard shell tacos a bit messy! 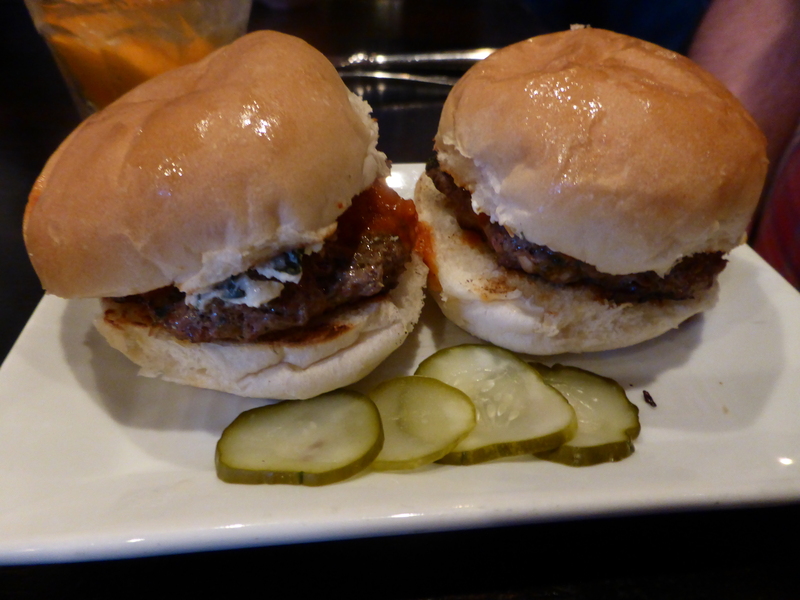 Neil went for ‘Two Run Farm’s Lamb Sliders -Tomato Chutney and herbed goat’s cheese‘. Although he was a bit disappointed with the small portion, he said that the sliders were packed with flavour and he even enjoyed the goat’s cheese although he isn’t normally a fan! We all agreed that although we enjoyed the smaller portions, if we were first time visitors that had not over indulged quite so much in the previous few days, it would be helpful for the staff or the menu to explain the concept of the food and make it a little more apparent that the dishes were small and intended for sharing! As the dishes were small, for once we were able to partake in dessert – I am most definitely glad we did! Mom and Neil chose ‘Chocolate Mousse Tacos – Strawberry salsa and cinnamon anglaise’. I loved the presentation and concept of this dessert, absolutely genius! I had the ‘Peanut butter ecstasy pie with nutella-butterfinger ice cream’. I am a massive peanut butter fan so this certainly hit the spot although it was rather rich, I think I could have done with a slightly smaller portion! The chocolate base was lovely and crispy, the ice cream added another dimension, such a fantastic dessert for a peanut butter lover! My Dad opted for the ‘Coconut cardamom panna cotta – local strawberry compote, amaretti cookie’. Another great dessert to finish off a wonderful meal! After dinner, we listened to the band for a while before venturing across the road to the weekly art market. 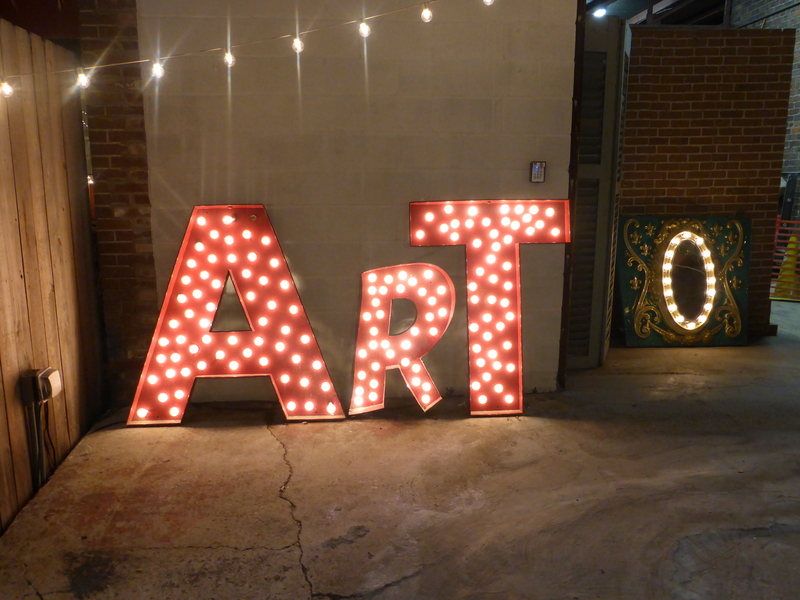 Frenchman Street art market is amazing! A quirky and unique place that definitely deserves a visit if you are in the area. 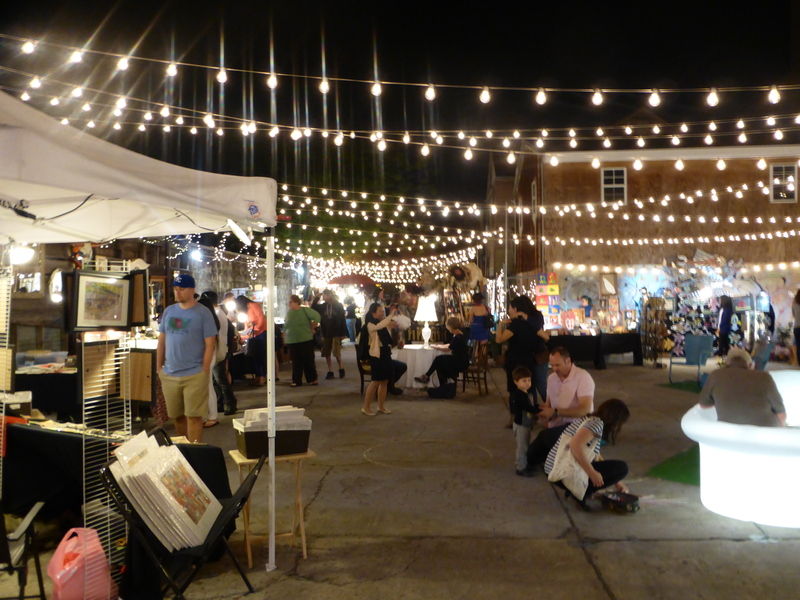 It takes place on Thursday – Saturday 7pm – 1am and Sunday 6pm – midnight…..only in New Orleans can you go to an art market that goes on until the early hours!!! If you want some original, handmade souvenirs that have been lovingly produced by local artists, do not, I repeat do not, go to the French Market! Instead venture a little further down the road and pop in to Frenchman Art Market, it will be the best ten minute detour you will have taken! I loved browsing around the market and instantly wanted almost everything for sale! Neil and I purchased a little ‘Po Boy’ magnet made out of a bottle cap to remind us of some of the amazing food we had eaten in the Deep South and also a wonderful black and white print by photographer Andy Levin to add to our ever growing collection! The girl who sold me the photo explained that the picture was taken not long after Katrina had hit and depicts one of the main roads in the city, Canal Street, completely underwater whilst the photographer helped transport an elderly lady from his neighbourhood to the Superbowl by canoe. The photographer really does have some beautiful shots which really depict the soul of this amazing city that never fails to bounce back, whatever life throws at it; a perfect souvenir for a memorable stop on our trip! 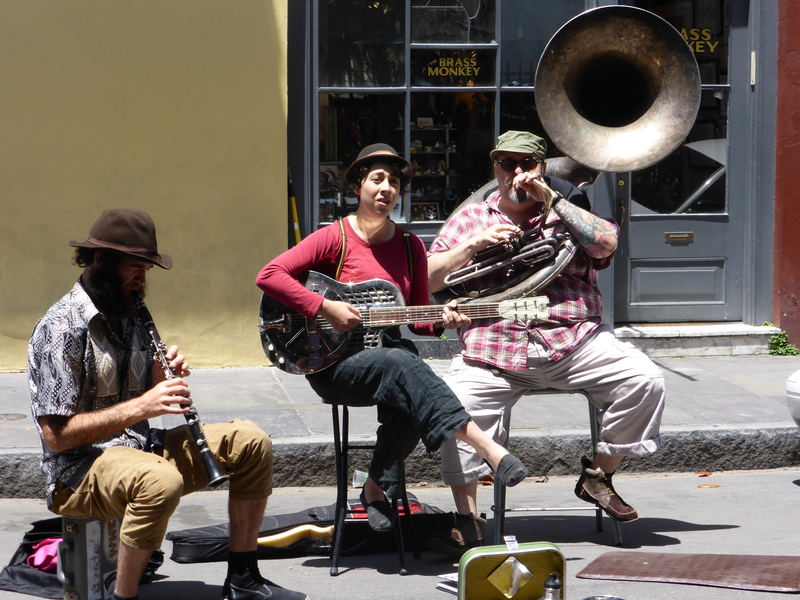 New Orleans is well-known as a unique city, famed for its’ nightlife, cocktails and music! 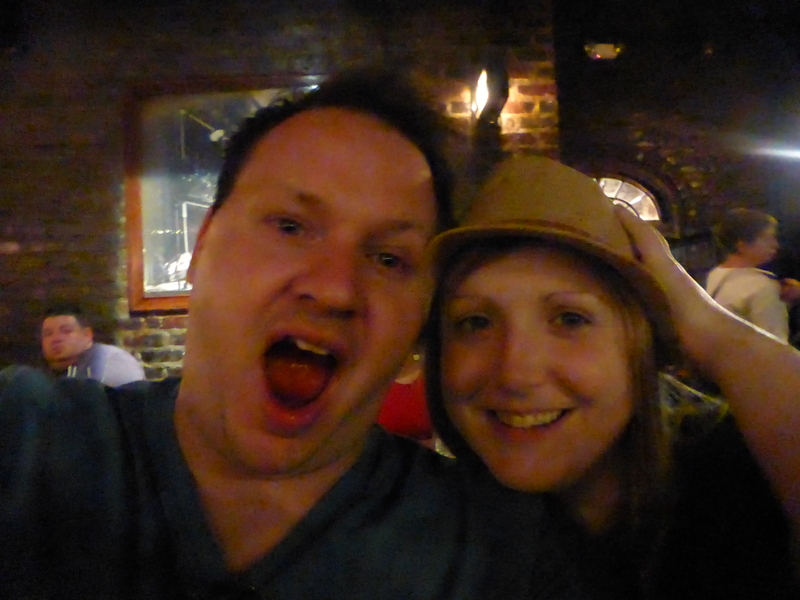 With that in mind, on our recent visit, Neil and I decided we deserved a night out in the French quarter in order to enjoy the world-famous tipples, people watch and listen to some of the best live music in the world. Wandering around the French Quarter is possibly one of the most fascinating and relaxing walks you can take in ‘the big easy’. Perhaps this is because it is possible to walk around with an ice-cold alcoholic beverage in hand, something that is unheard of here in the UK! Yes, Bourbon Street is rather tacky and touristy, but it must be experienced and being able to meander down the world-famous thoroughfare with a cocktail somehow makes it more interesting! Numerous bars and stores have holes in the wall in order to get a luminous New Orleans’ hurricane or hand grenade to take away. Although these cocktails are sickly sweet, the daiquiris and other frozen offerings are a fab way to cool down from the sweltering heat and humidity of the city. 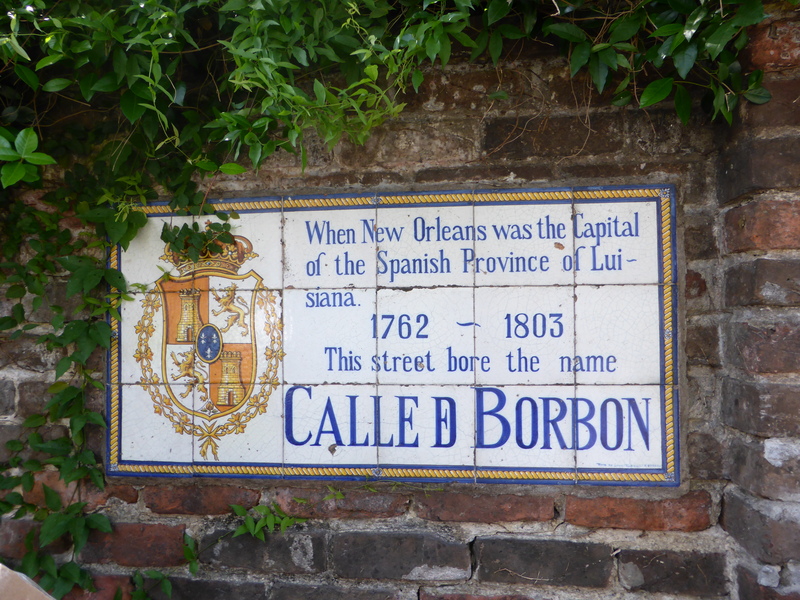 Bourbon Street has long been associated with over-indulgence and vice; as far back as the 1880’s people were visiting this area of the French Quarter to drink, gamble and have sexual encounters. It doesn’t appear that the street has changed an awful lot as there are still a huge amount of strip clubs near the Canal Street end, with lots of scantily glad women standing in darkened doorways, attempting to entice the many men on stag weekends, most of whom are half cut at 10 in the morning, inside! A section of Bourbon seems like a seedier version of London’s Soho, however, there are a few gems further up the road in the more civilised ‘lower quarter’. 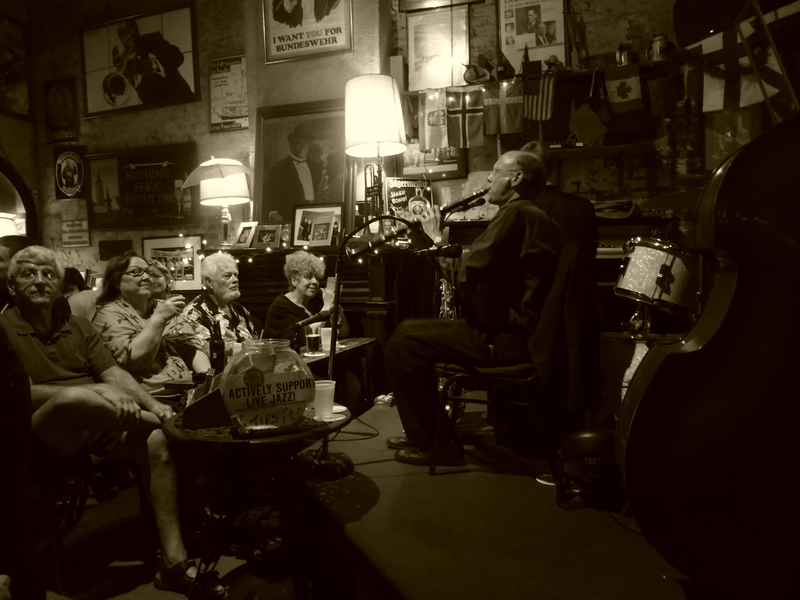 The one thing that struck me most about French Quarter bars was the presence of live music. Everywhere. Even at 11am! Every bar, restaurant and street corner featured a group of performers giving it their all! If you like the sound of talented musicians to accompany your bourbon on the rocks, you could do worse than a trip to NOLA! There are some fantastic bars and music venues that are not to be missed in the French Quarter; as previously mentioned, Fritzel’s on Bourbon is a good place to start. For those hard-core jazz aficionados who don’t mind queuing a while, Preservation Hall is supposed to be a great place to catch a one hour show but be warned, you may well have to sit on the floor and they do not serve alcohol inside the venue! Unfortunately, we did not make a show there on our most recent trip but it is an excuse to return! A fantastic, characterful and atmospheric bar, situated away from the madness of the upper quarter end of Bourbon Street is Lafitte’s Blacksmith Shop. Built in the early 1700’s, the premises is rumoured to be the oldest building in the United States to be used as a bar; described as a “gumbo” of truth, the building certainly has a colourful history! 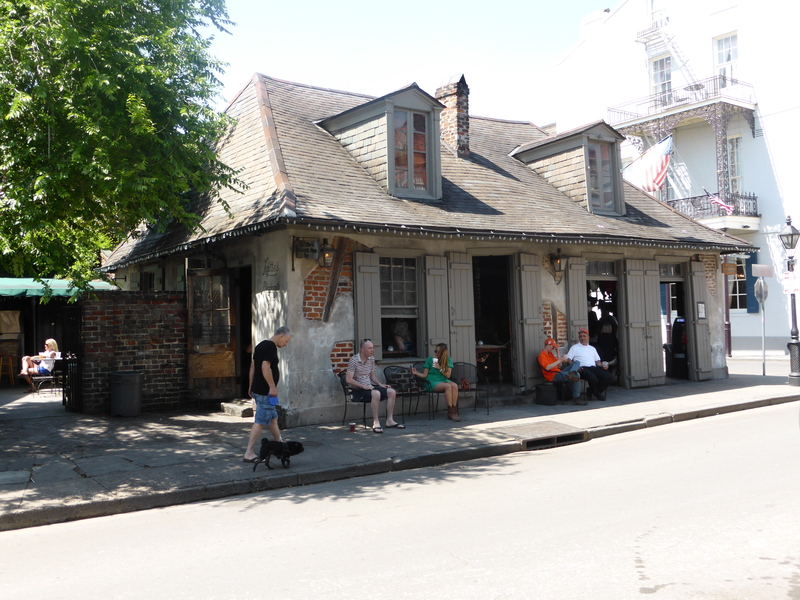 The ramshackle bar is lucky to still be standing after surviving several fires that destroyed most of the Quarter in the early 19th Century and, latterly, hurricane Katrina. It is named after the Lafitte brothers who apparently operated their smuggling business from the location in the late 1700’s. Another great spot for a few chilled out, afternoon, drinks is Crescent City Brewhouse, a little further away from Bourbon on nearby Decatur Street. The only French Quarter microbrewery, the bar brews four different types of world-class beer in-house from the dark, malty ‘black forest’ to a light, crisp pilsner. Not only is the brewery a great place to grab a refreshing beer, it also serves great food and, of course, more often than not features live jazz. 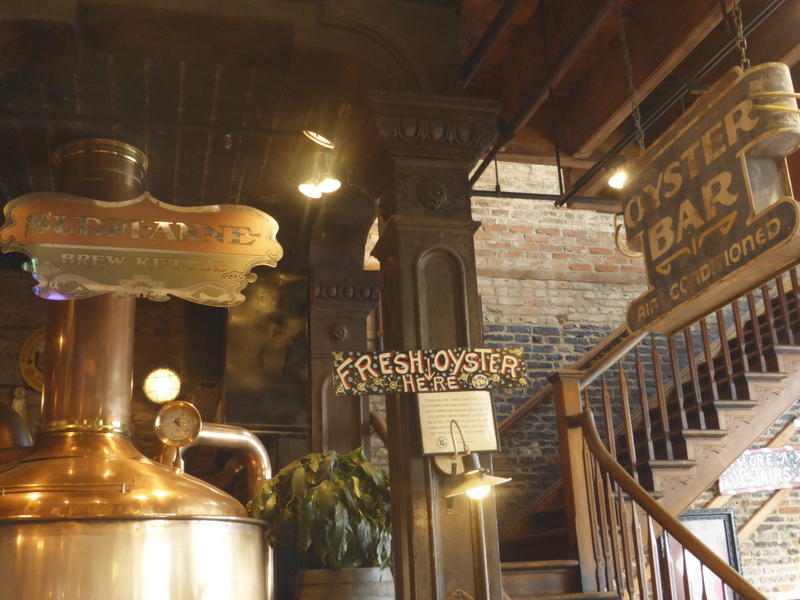 For the best seat in the house, sit at the long, central bar to watch the art of oysters being shucked whilst getting a great view of the band serenading lunch customers and tourists meandering down Decatur. 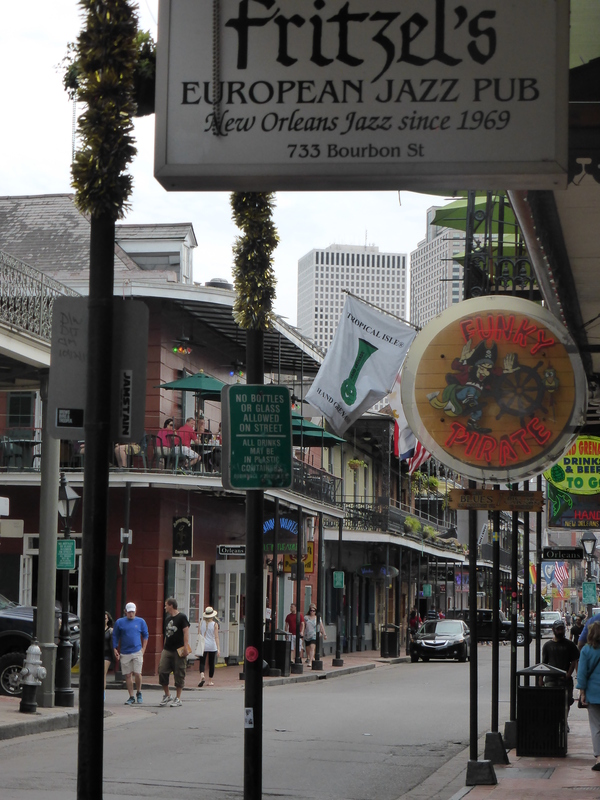 For a visit to a New Orleans staple, a stop at Pat O’Briens, home of the hurricane, is an absolute necessity. 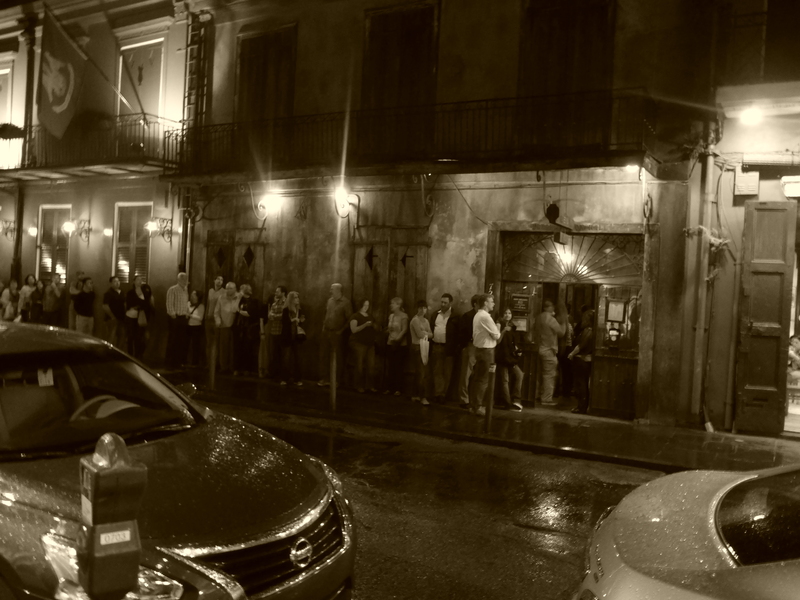 Yes, Pat O’s is most definitely touristy but it still retains that NOLA charm which makes it a fun place to visit. In fact, the bar’s motto since 1933 has been “Have fun!”, something that visitors have been doing since the end of the prohibition! In the 1940’s, the ‘hurricane’ cocktail was invented by Pat O’Brien himself due to a short supply of local liquor, such as bourbon and whiskey, however, rum was being imported into the city via the Mighty Mississippi and so, the hurricane was born! Watch this space for the recipe. 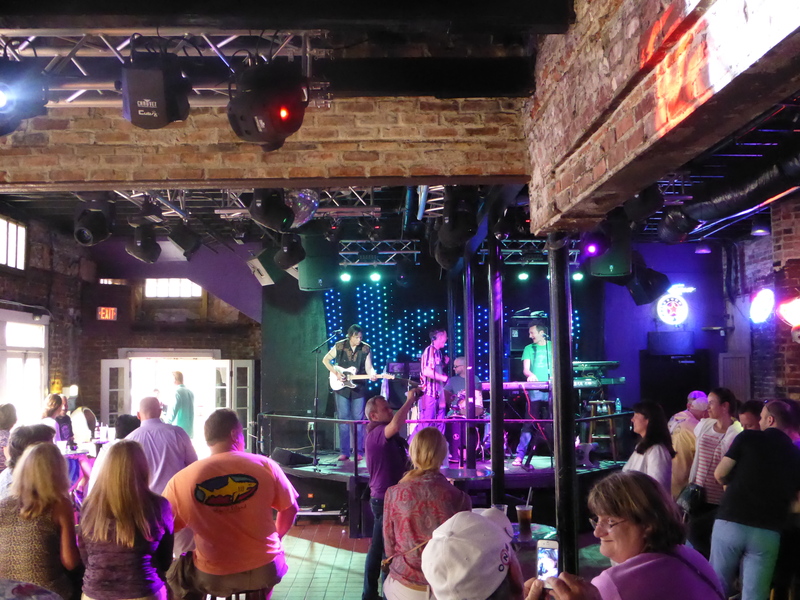 The Bourbon Street premises features two bars, one of which features ‘dueling’ pianists, and a courtyard restaurant. Neil was a massive fan of the piano bar (and the strong cocktails), so much so it was difficult to drag him away! 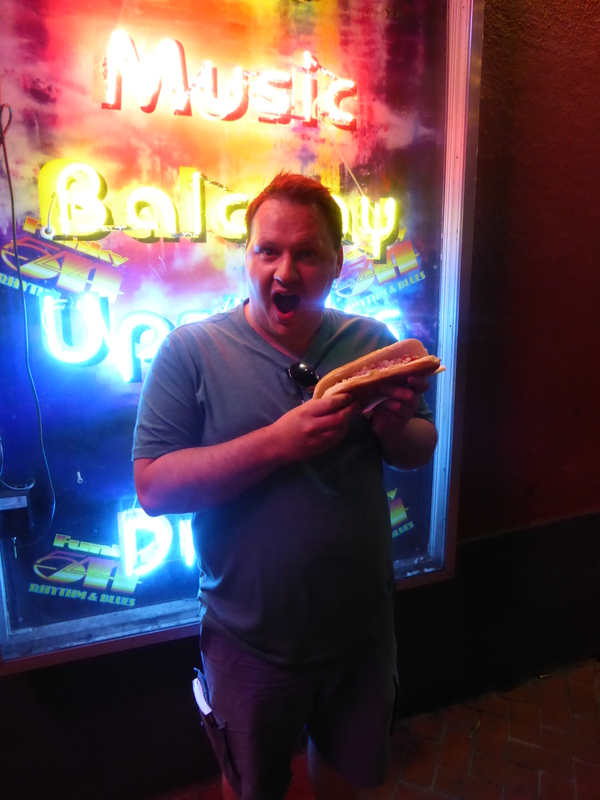 After visiting several bars in the French Quarter, we were in serious need of sustenance so made the short journey across the road from Pat O’s to Yo Mamma’s, an eclectic bar and grill. I love a good burger, especially after a few drinks, and Neil is a bit of a burger connoisseur (if such a thing exists!) as he frequently orders them when we go out to eat; due to this, we like to think we know a good burger when we eat one. Yo Mama’s serve seriously good burgers. Scrap that, unbelievable burgers, quite possibly the best burgers in the world!! I honestly do not think I have tasted such a flavoursome, juicy burger anywhere; the beef is so tender and flame grilled so that it is almost caramelised. 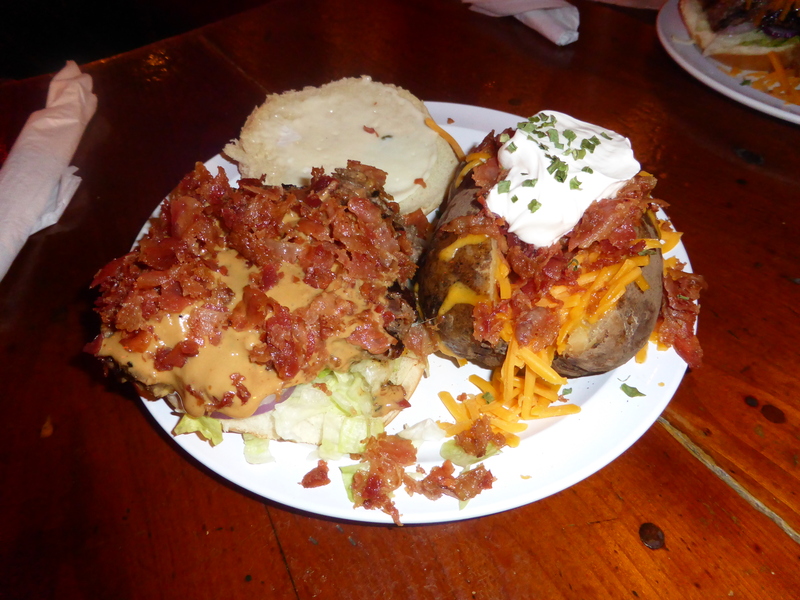 Bizarrely, the burgers at Yo Mama’s are served with a massive baked potato topped with all the fixings – butter, sour cream, bacon bits, cheese and chives! Although delicious, the potato is rather filling to say the least and, trust me, you want to make sure you finish your delicious burger. Much to Neil’s horror, I couldn’t resist sampling the peanut butter and bacon burger! It was awesome and surprisingly, the creamy peanut butter and the crispness of the streaky bacon really compliment the smokey flavour of the beef. Highly recommended for peanut lovers! Although the bar is pretty small and the presentation of the food leaves much to be desired, make sure you make a trip to Yo Mama’s, you will not regret it! After a few too many hurricanes, there is only one place to go, the Cat’s Meow on Bourbon Street. One of the first bars in America to develop a love of karaoke, it has since been named ‘the best karaoke bar in the world’. Apparently. Always take things you hear in NOLA with a pinch of salt!! Saying that, the Cat’s Meow is a fantastic place to people watch whilst hords of drinkers venturing along Bourbon Street sway into the bar, treating customers to a few out of tune songs whilst strumming a blow up guitar; after a few too many Southern Comfort’s you may feel the need to join in yourself! 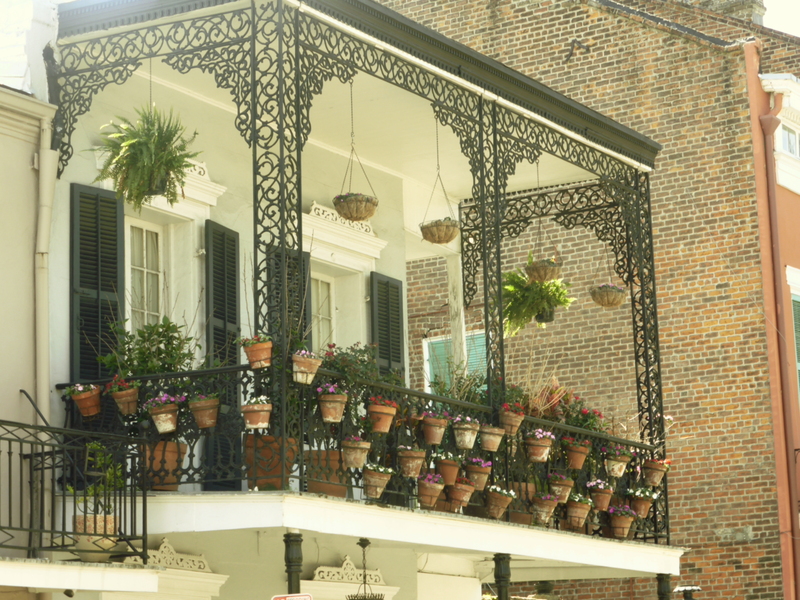 Anyone who has visited this famous city cannot deny that it has character, you honestly cannot make New Orleans up! From an old man walking alone down Bourbon Street dressed as a lobster, to cowboys singing karaoke, you are guaranteed to have a good story, or six, after a night out in the French quarter; it will definitely be a night to remember! 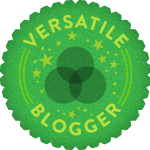 Enjoying my recent posts about my foodie travels around the Deep South? 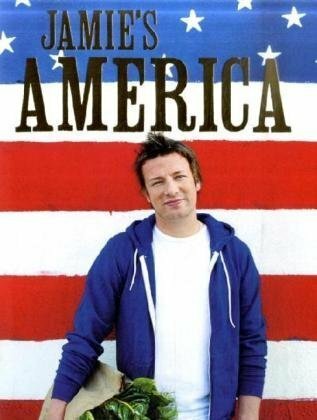 Then you must go out and buy one of my favourite cookbooks, Jamie’s America. Although the cookbook isn’t entirely authentic, Jamie Oliver’s interpretation of Southern cooking is simply delicious and must not be scoffed at! Not only does the cookbook contain recipes from all over the United States, it also features some of my Southern favourites; jambalaya, red beans and rice, sweet potato pie, grits, hush puppies, barbecue and more! This cookbook is certainly worth every penny! 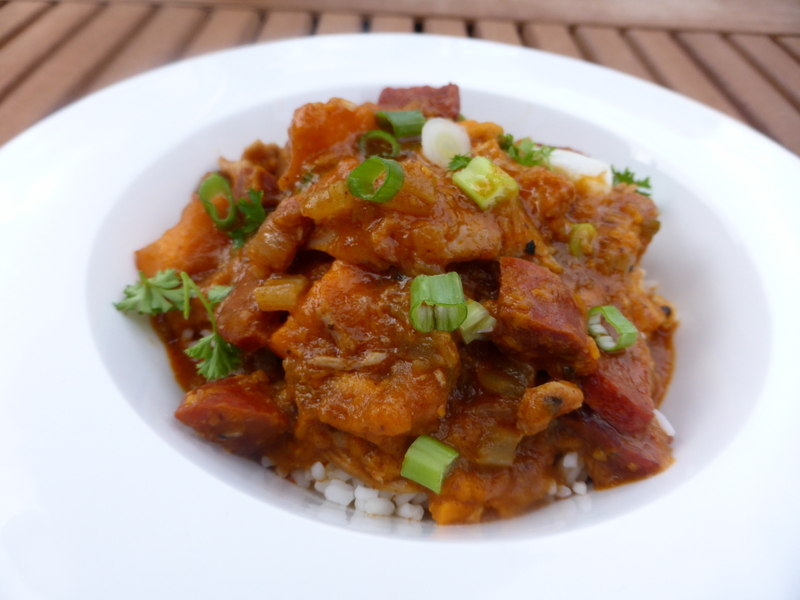 One of the recipes I first attempted from the cookbook was ‘Spicy Meat Gumbo’. One summer whilst I was at University, I visited my parents in Vicksburg; this was the summer I discovered my love of gumbo and I swear I hardly ate anything else!!! 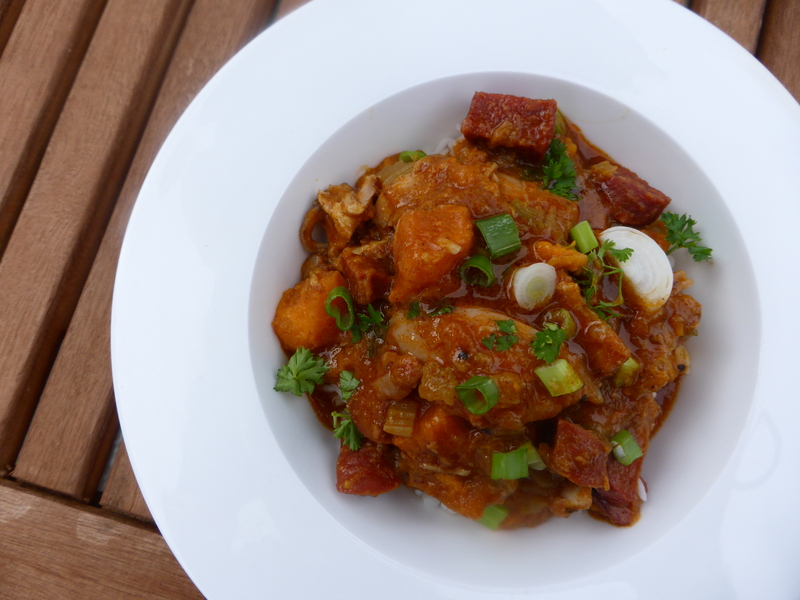 Up until our recent vacation, Neil had only tried the Jamie Oliver version of this tasty dish, which I am sure many gumbo enthusiasts would not agree with due to the presence of chorizo and sweet potato! 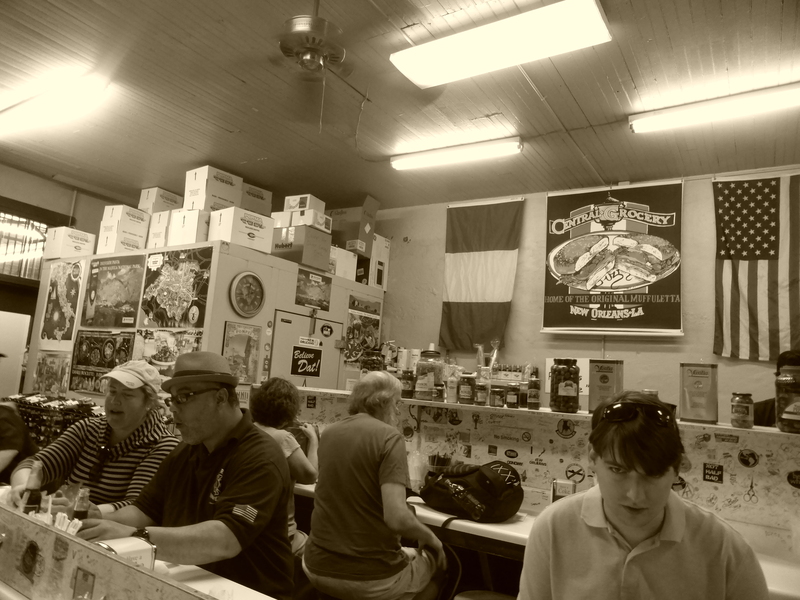 Luckily, we were able to sample the real deal at the Gumbo Shop in the New Orleans’ French Quarter. However, if you aren’t able to make the long trip to Louisiana, this dish is a tasty alternative! 1. Season the chicken with the salt, pepper and spices. 2. Put a large saucepan on a high heat, add a little oil and fry the chicken, chorizo and bacon for approximately 15 minutes until golden and crispy. Using a slotted spoon, remove the meat from the pan and set aside. 3. Turn down the heat and add the onion, peppers and celery to the pan. Cook gently for about 10 minutes until soft then stir in the flour to make the roux. Cook very gently, stirring constantly until the roux gets nice and dark and the flour has been cooked out; this can take between 10 – 30 minutes depending on how brown you want the roux to be. Peanut butter colour is a good starting point! 4. Add the garlic, sweet potato, browned meats, thyme and bay leaves to the pan and cook for a further minute. Pour in the stock, bring to the boil then turn down the heat and allow to simmer for 45 minutes or until the chicken is tender and falls off the bone. 5. Once cooked, scoop the chicken out of the pan and shred the meat off the bone. Discard the skin and bones and return the meat to the pan. 6. To serve, roughly chop some parsley and stir into the gumbo. 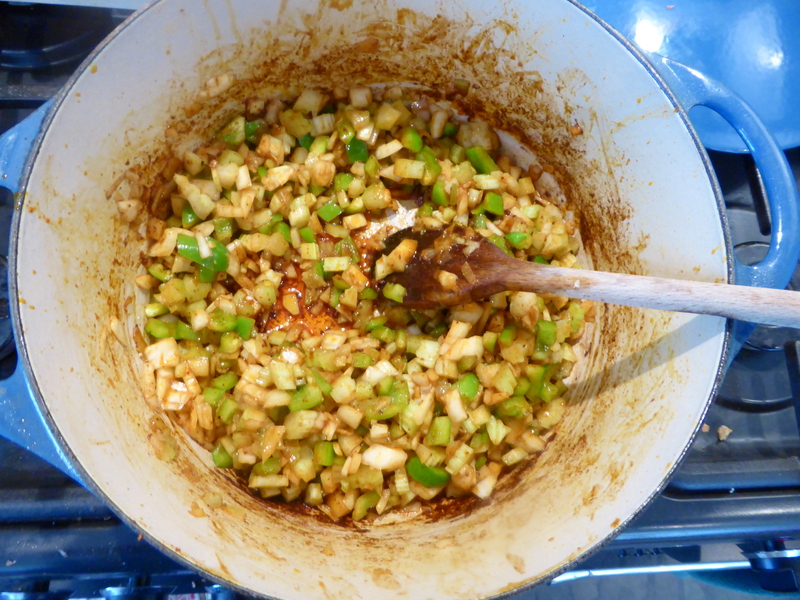 Throw in a bit of cooked rice and scatter sliced spring onions over the gumbo. Enjoy!! Words cannot describe how much I adore this recipe! The cayenne and paprika add a nice depth of flavour and spiceness to the dish, which is further complemented by the chorizo oil that is released during the cooking process. The chicken is so tender and juicy due to the slow cooking and, as the sweet potatoes break down, a sweetness is added which is not typically found in gumbo but, I think, adds another dimension. Gumbo is typicall made with Andouille sausage, native to Louisiana and France, however, it is hard to get hold of in the UK. Jamie Oliver suggests chorizo as an alternative and, although the flavour is very different, I think it works really well. There are some great UK chorizo producers, so why not use a fantastic UK product in this dish! Give this recipe a try, I promise you will keep coming back for more! Perfect for a taste of New Orleans during the British summertime. Our second day in New Orleans involved an awful lot of walking and exploring of the French Quarter, so it was only right that we ensured that we had some decent sustenance along the way! 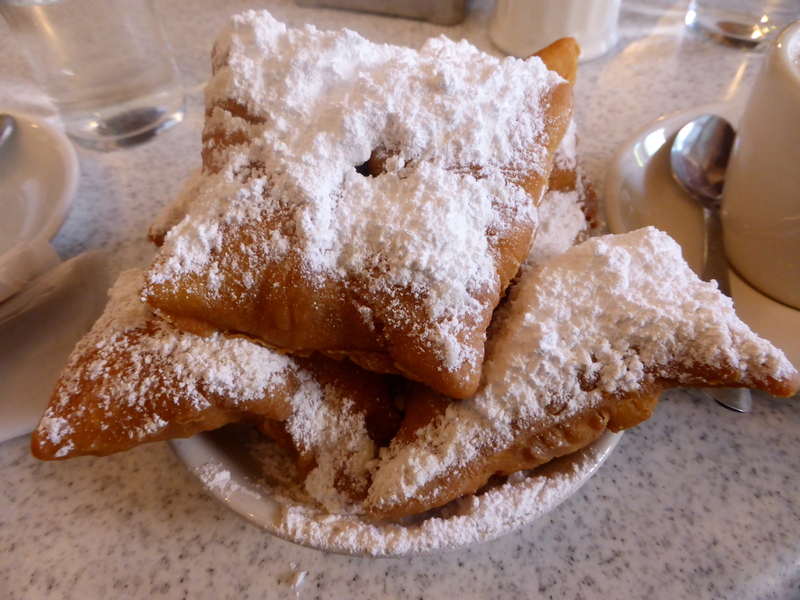 Cue some world-famous doughnuts and a humongous sandwich, New Orleans style! Breakfast involved grabbing a table at the French Market’s Café du Monde, the world-famous home of the legendary beignet; in fact, Café du Monde’s sweet fare is so famous, it has featured in numerous books and films across the globe! The donut like pastry, covered in mounds of powdered sugar, is another example of the French influence on New Orleans cuisine. History states that early French settlers, who journeyed from Canada to the South and discovered the famous port town, brought with them the beignet and chicory coffee, both of which are served at the famous café. 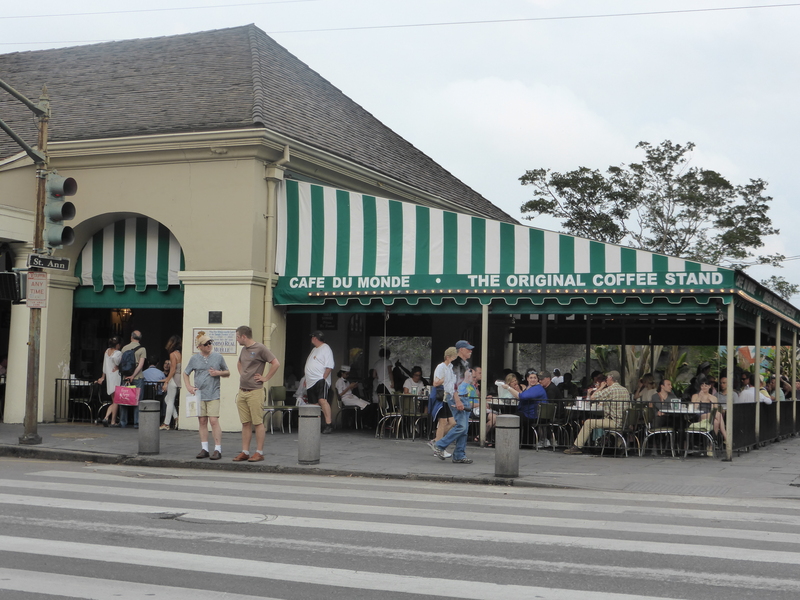 The original Café du Monde has been a permanent fixture at the French market since 1862; a quick bite at the café is certainly a taste of authentic New Orleans, as the recipe used for the famous deep-fried choux pastry remains largely unchanged. The menu is very basic – a small selection of drinks and only beignets to eat however, sampling a few of the cafe’s powdery delights is the perfect hangover breakfast or mid-afternoon sugar rush! True to NOLA’s roots of being known as a city that knows how to party, the café is open 24/7 for those that need their breakfast on their way home from the Bourbon Street action; at under $5 for three beignets and a coffee, it certainly is a bargain! The beignets themselves are utterly delicious, served warm, so sweet and fluffy, they go down far too easily! Be warned, no matter how hard you try, you will get covered in icing sugar when eating so it is advised not to wear dark clothing when visiting Café du Monde! 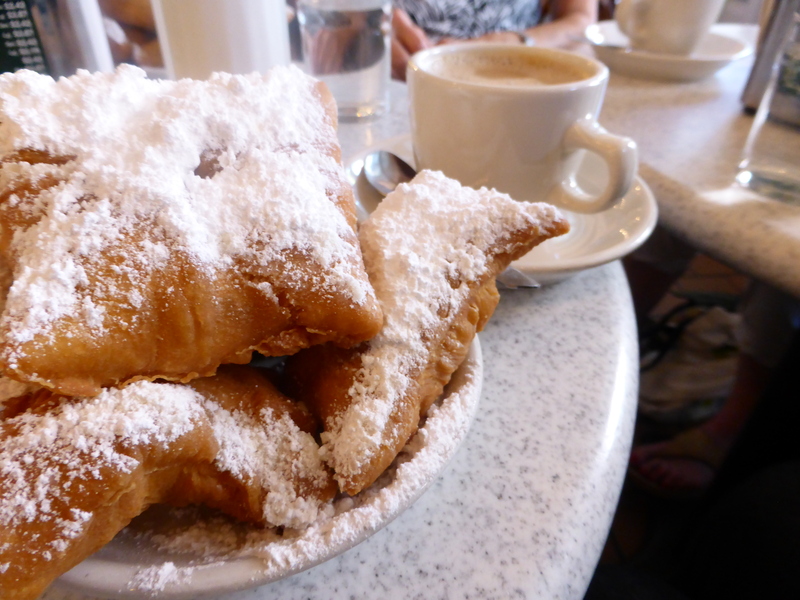 Locally, there is much debate about who makes the better beignet, Café du Monde or Café Beignet, both of which have numerous locations across NOLA. Having tried the beignets at the latter, I found them to be a little tough and more chewy than those at the French Market, although they did have a bit less sugar on which was a bonus for my clothes! Café Beignet have a premises at the Musical Legends Park on Bourbon Street which makes for a fantastic afternoon pit stop with the bonus of some live music! However, Neil and I are firmly in the Café du Monde camp, but it is all up to personal preference so if in New Orleans, why not try both! After an awful lot of walking on a very hot day, it was time to eat again (surprise, surprise!!). 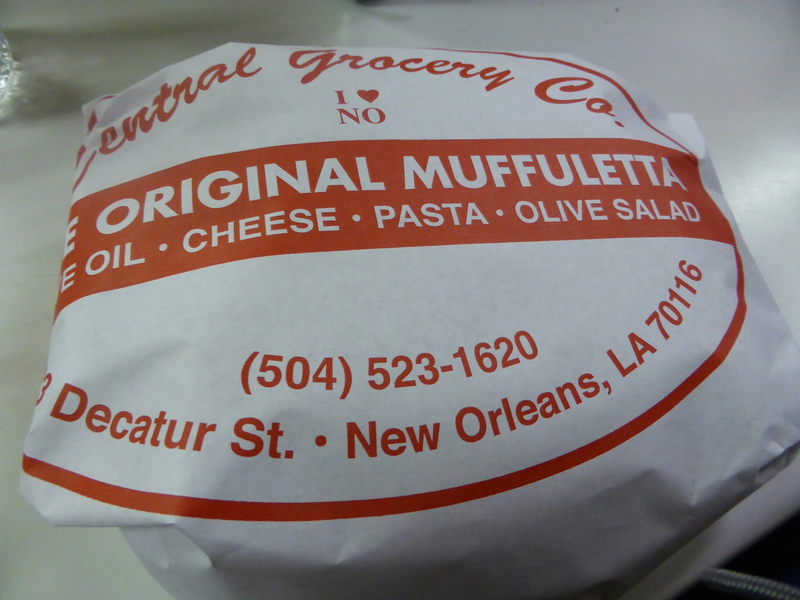 Upon a friend’s recommendation, we decided to check out Central Grocery, home of the muffuletta, so it was back to Decatur Street! 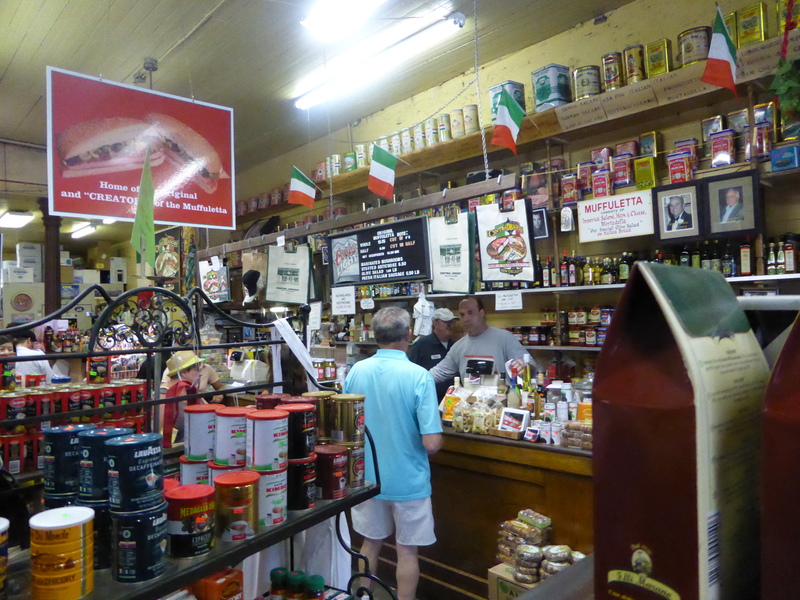 Central Grocery is a fab place to visit if you have fallen in love with the local New Orleans cuisine; it stocks a good range of Cajun and Creole cooking necessities such as various seasonings, hot sauce, chicory coffee, and an important Gumbo ingredient, file. The shop is crammed with shelves bulging with local delicacies, so much so that the queue to order food at the long counter snakes all around the shop! 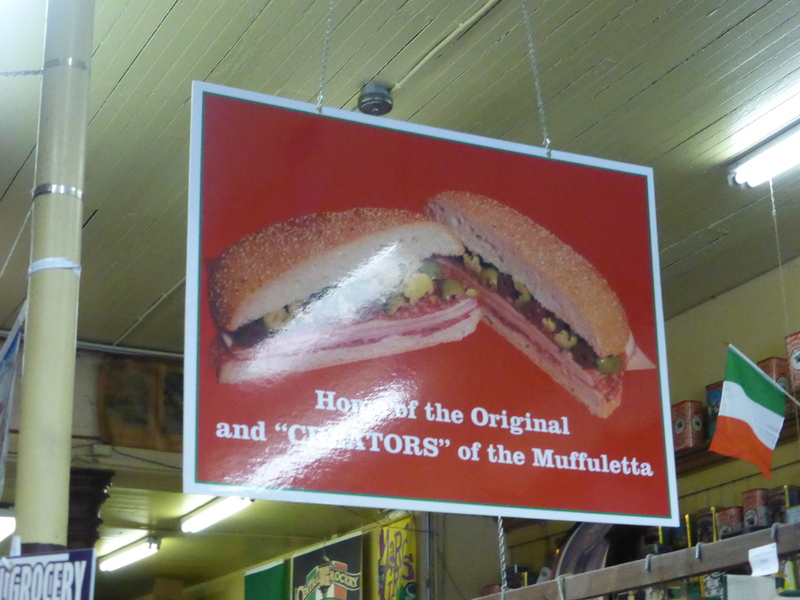 Like po’boys, muffulettta’s are massive sandwiches that were originally a staple of the working class diet however, unlike po’boys they are normally served cold. 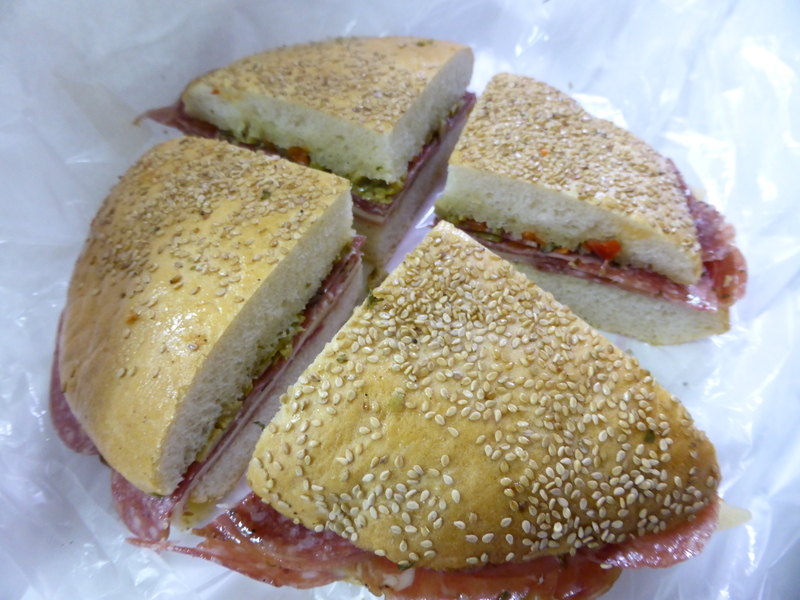 According to the owners of Central Grocery, the sandwiches were devised in 1906 so that Sicilian farmers working at the local French market could eat their beautiful Italian delicacies for lunch in an easier, more portable and accessible, fashion. Rumour has it that the humble muffuletta would keep the farmers going throughout the day and, due to its vast size, would serve as dinner back at home once heated in the oven. The name refers to the type of bread used to make this massive sandwich; it is very soft and appears to be made with olive oil like a focaccia however, it is round in shape. The bread is then stuffed with cured meats, such as salami and ham, cheeses, including mozzarella and provolone, and olive salad which is a mixture of olives, herbs and pickled vegetables and available to purchase from the store. It is possible to get an order to take away or, if you are lucky, there may be a free seat at the back of the store on which to enjoy your lunch and take the weight off your feet. 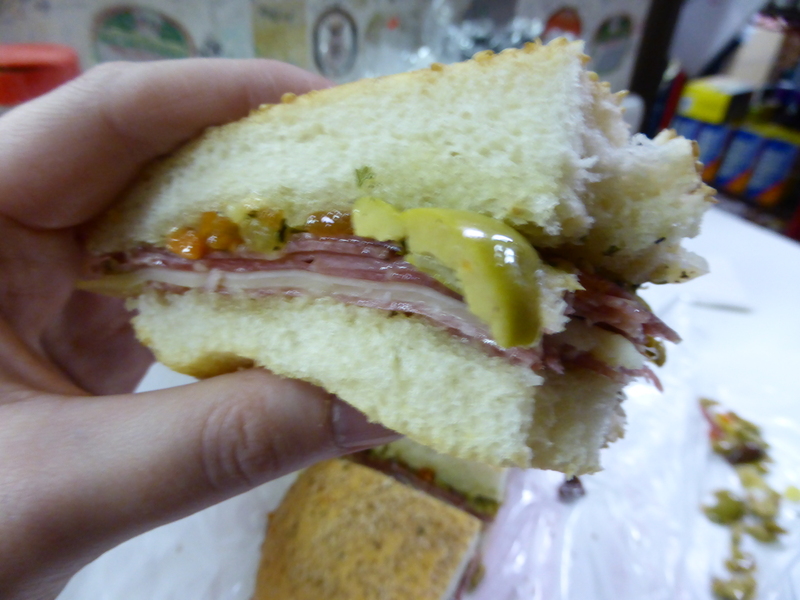 I thoroughly enjoyed our muffuletta; the olive salad provided a nice, salty contrast to the creaminess of the cheese and smokiness of the meats. It is most definitely a fantastic and filling lunch to enjoy whilst exploring the French Quarter! In fact, the humble muffuletta is so highly rated that it has been questioned whether it is the best sandwich in the whole United States! Definitely one to tick off a foodie bucket list. As you can see, the sandwich is huge so half of one between two people will more than suffice! If you cannot resist an entire muffuletta like we did, do not worry about wasting any if you get full up as it tastes even better hours later after a few cheeky cocktails in the French Quarter! New Orleans has to be one of my favourite places in the whole world and, for me, was one of the most anticipated stops on our tour of the South. I adore everything about the city, fondly known as ‘the big easy’ by many, or NOLA by locals. I cannot get enough of the sights, smells and sounds of the place; it literally has everything a tourist could want from beautiful architecture, to intriguing history, some of the most mouth-watering food in the world and endless jazz music wafting through the air. 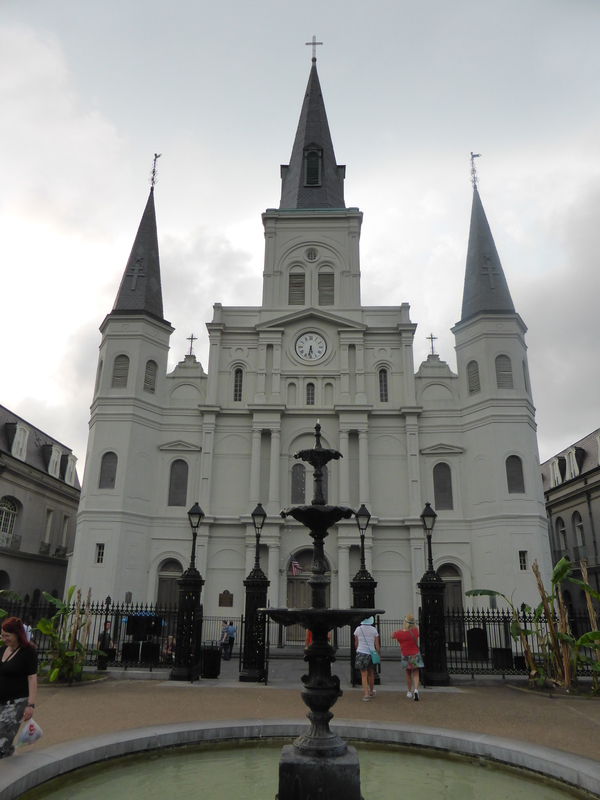 Most people now associate New Orleans with hurricane Katrina however, it is so much more than that and I urge anyone to pay the city a visit….I promise you that you will fall in love and that one visit will not be enough!! On our first night in New Orleans, we were fortunate enough to have the company of some wonderful friends who we knew from our time living in Mississippi. After a few afternoon drinks and a lot of catching up, we decided to meet in the French Quarter for dinner and music. After talking through a few options, we ventured to the Gumbo Shop, situated in the heart of the quarter, on the edge of Jackson Square. As you will discover by reading my next few posts, New Orleans really is a foodie mecca and specialises in such a large variety of different cuisines and dishes; the flavour of the city is truly unique as it has evidently been influenced by so many different cultures. As NOLA was discovered by French colonists, a French influence on the cuisine is startlingly apparent; indeed, Cajun dishes indigenous to New Orleans are a blend of French and Southern flavours and techniques. Gumbo is a dish most associated with Cajun and Creole food and originated from the area, so it seemed apt to sample some of the city’s finest gumbo on our first night in town. Wondering what on earth gumbo is? Thought you might be as it is not that common here in the UK! 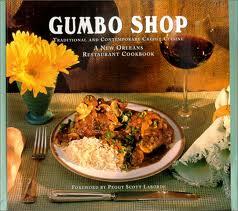 Gumbo is a fusion of so many different cuisines that it is almost impossible to uncover its true origins. It is thought that the dish was first made in New Orleans at the beginning of the 18th century, due to the availability of imported goods that were appearing in the port town and the influx of both French settlers and African slaves. Gumbo is of soup like consistency, almost like a bouillabaisse, with a handful or so of rice thrown in for good measure. There are so many variations of the filling dish however, one thing is certain, it must contain the so-called ‘holy trinity’ of onion, celery and green pepper. These three ingredients are similar to ‘mirepoix’ and demonstrate the French influence on Cajun and Creole cooking as the majority of local dishes start with this base. The secret to the perfect gumbo is in the roux, a thickening method used by cooking a mixture of flour and fat until browned – the darker, the better! 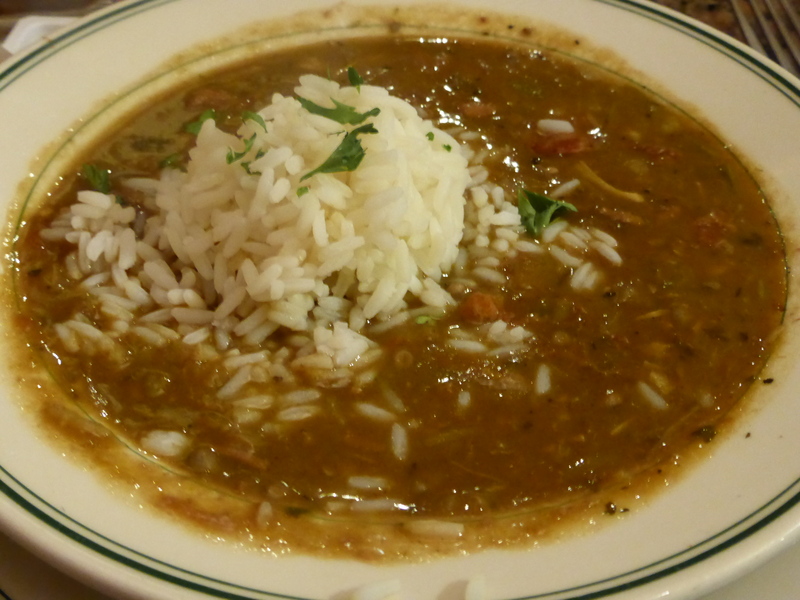 Okra, Andouille sausage, chicken and seafood all feature in different gumbo recipes; Creole gumbo tends to contain shellfish whereas Cajun gumbo is darker and meatier. Some recipes contain Andouille, a smoked pork sausage which originates from France but is widely produced in Louisiana. 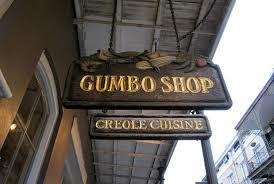 My gumbo at Gumbo Shop was truly delicious! 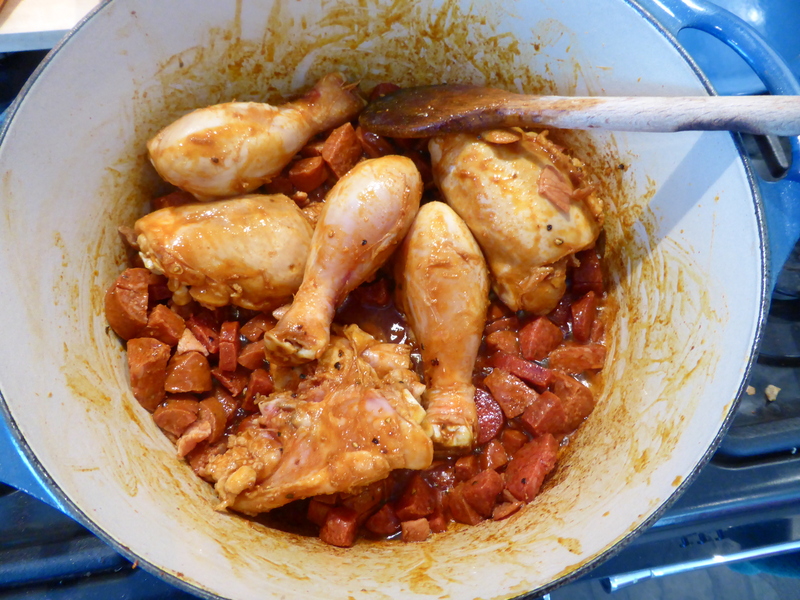 The roux was dark, the chicken and sausage plentiful and the flavour smokey and slightly spicy. With a salad on the side, I was well and truly stuffed but still wanting more! I would thoroughly recommend a trip to the Gumbo Shop to get a true taste of Cajun and Creole cuisine as they do it oh so well! To get a taste of New Orleans at home, why not order the Gumbo Shop cookbook or watch this space for one of my favourite, albeit not as authentic, gumbo recipes! 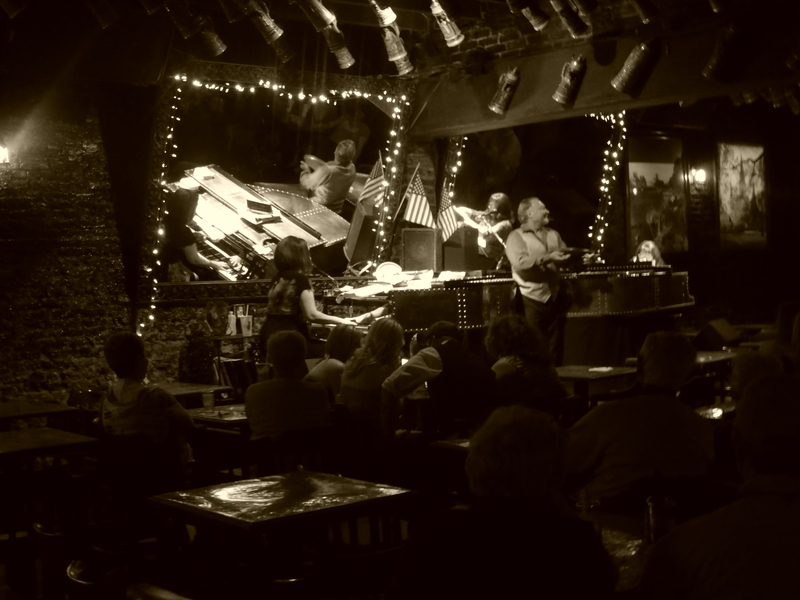 After dinner, it was time for a short meander over to Bourbon Street to enjoy some drinks and live jazz….they are what the big easy is famous for after all!! My parents discovered Fritzel’s some ten or so years ago on a visit to New Orleans and have returned upon every visit to the city! Parts of Bourbon Street certainly are seedy, particularly the ‘upper quarter’ area close to Canal Street which is heaving with strip clubs. Fritzel’s, although situated on the famous street, is in the slightly more refined ‘lower quarter’ and appears more authentic than many of the tourist heavy bars – it is in fact the oldest jazz club in the city! The place certainly has character with old posters and jazz memorabilia covering every inch of the walls; if you are after a plush surroundings in a sophisticated bar you have come to the wrong place but if you wish to find somewhere unique to New Orleans and a lively atmosphere, look no further! Be warned, the bar is pretty small so to get in on the wonderful jazz action, you need to arrive early to get a decent seat by the stage. If, like us, you are unlucky to get a seat inside, it is possible to relax in the shaded courtyard garden for a while, to escape from the sweltering humidity, and grab a seat inside when one becomes available. The music at this renowned jazz bar is unbelievable, it truly is the sound of New Orleans! Each musician is ridiculously talented in their own right, the music is so energetic and fast paced it is a wonder how they all keep up! For an insight into the type of jazz played at the bar, check out their website here. Fritzel’s have produced several albums which are available for purchase on iTunes. An evening at the French Quarter bar is always memorable. On our most recent trip there, a girl from the audience who was in the midst of a pub crawl and busy doing shots with her friends got up with the house band to sing on stage. She had a stunning voice, well suited to traditional style jazz, and performed beautifully which was rather lucky seeing as the band had never met her before…..you really could not tell it was their first time performing together!!! There tends to be no cover charge in place most of the time at Frtizel’s and the service and atmosphere are terrific! 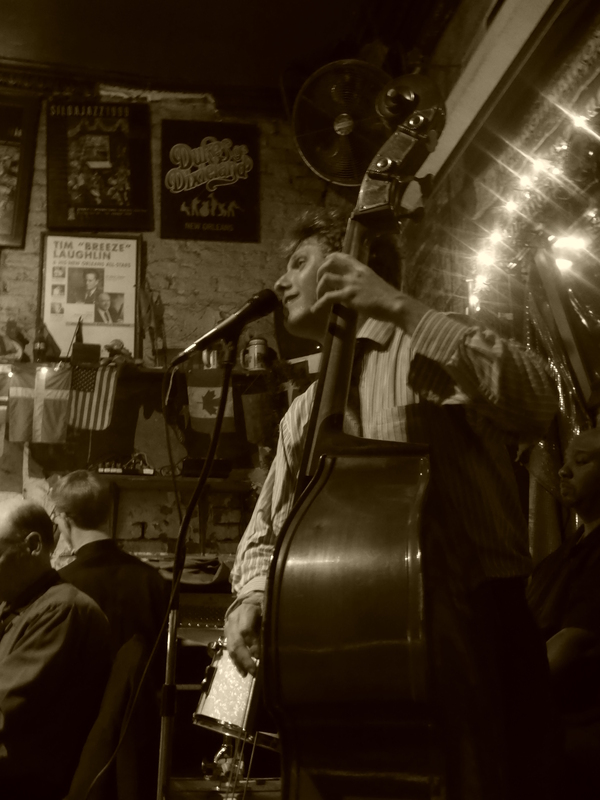 In order to catch a glimpse of the ‘real’ New Orleans jazz scene, be sure to pay Fritzel’s a visit when you are next in town!